For this Toy Story birthday cake, I used fondant and marbled it for the wood grain of the floor. Also, made it look like slats of wood. 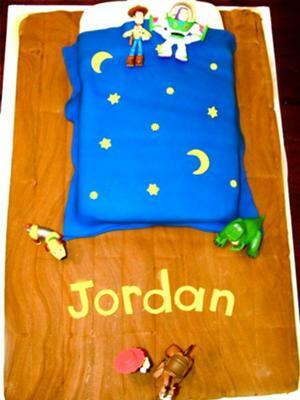 I used fondant for the bed and name as well. The characters came from buddy packs that I got from the store. This cake was relatively easy to make. It took two cake mixes, one for the floor and one for the bed. I used a large cake pan (11x14) for the floor and a small one for the bed. Very nice job !!!! WOW !!!!!!!!!!!!!!!!!! Join in and write your own page! It's easy to do. How? Simply click here to return to Toy Story Cakes.